Try out Rolesia.com - Test the standard version for FREE! New! Version 2.4 with USA Update is here! Q: How can I pay for a license? A: Professional and Corporate Licenses can be purchased via PayPal. At PayPal you can pay via credit card or from your bank account. After the purchase you will be redirected from the PayPal page to Rolesia.com to finalize the purchasing process. Q: Money back guarantee: What does this mean? A: The purchasing of license is done via PayPal. PayPal guarantees the possibility to reject a payment for up to 21 days if you are not satisfied with the product. Furthermore, we want our customers to be fully satisfied with the product. If you are not happy please contact our sales department. Q: I purchased a Standard license. Can I upgrade to Professional? A: An upgrade is possible by purchasing a professional license. Your data will however not be retained as you will have access to many more features, which were not available in the Standard license. Q: Can I extend my Professional or Corporate license? A: Yes. Please go to Settings > License and extend your license according to your requirements (time-based model or version-based model). If you need advice please contact sales or our support team. Q: Which macroeconomic policies can I directly steer? A: Currently you can directly pursue both monetary as well as fiscal policies. Monetary policies include a direct adjustment of the interest rates, the (de-)leveraging of your central bank reserves comprising currencies (euro and US dollar reserves), commodities (gold an oil reserves), and when necessary urgent measures such as money printing to purchase assets, such as bonds, also known as quantitative easing. 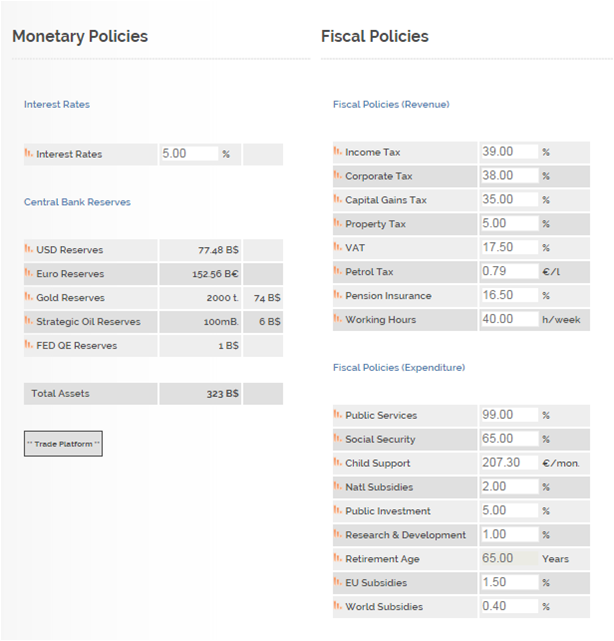 Fiscal policies include revenue and expenditure measures. Measures to amplify or reduce your revenue are the heightening or reduction of tax levels such as the income tax, corporate tax, capital gains tax, property tax, value added tax, petrol tax, pension insurance, as well as, the heightening of working hours to make your industry more competitive and increase your income tax base. Measures to reduce or expand your cost base include all major cost-related you have in your economy, including the public services (e.g. infrastructure, government services), social security (e.g. unemployment and disability benefits), child support to parents, national subsides to support your industry and services (and cave in to pressure from lobbyists), public investments (short-term to medium term measures to invest in the economy needing investment impulses), research & development (supporting the development of new innovations in all sectors. Beware, however, of competing with the private R&D endeavors), retirement age, EU subsidies (to support countries within the EU) and world subsidies (to support developing countries needing international aid). Q: How can I retrieve graphs? A: To retrieve graphs simply click on the icon on the left hand side of the indicator. The graph will appear in the view area..
Q: How can I access the multi-graph view? 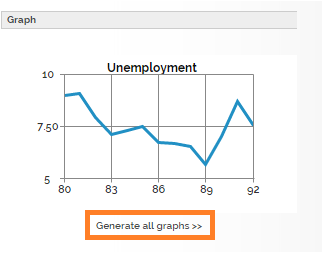 A: To access more than one graph you will need to click on Generate all graphs >> below the graph view. You can there access a single and multiple graph view. 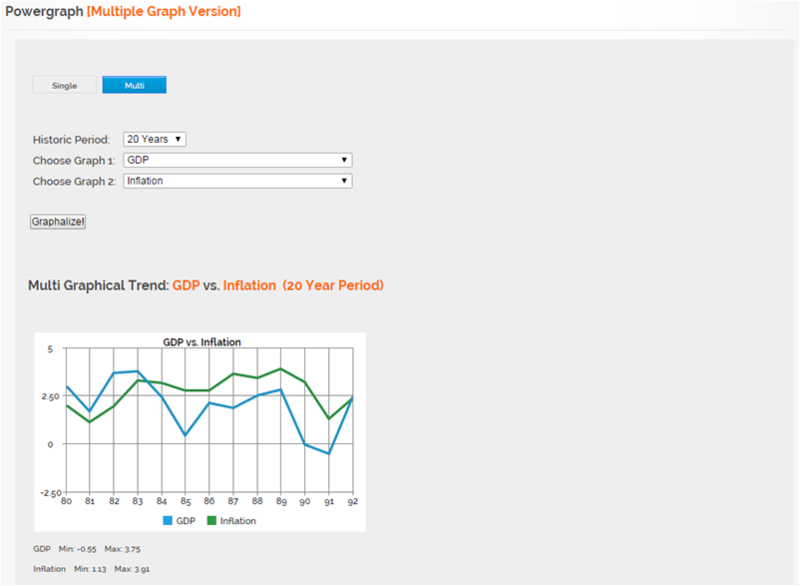 Now you are able to compare economic indicators for historic graphs up to 60 years. Q: When I log in to my account I get the following error message: �Your login credentials are incorrect. Please login with the correct team name and password." A: Please verify your team name and password. Standard license customers have the prefix �demo� added to their team names. If you requested the team name �john� then you will need to log in using �demojohn�. Both your team name and password are sent via e-mail when you have purchased a new license.